Aluminum Christmas Trees: 7ft Deluxe Slim. Buy Now. 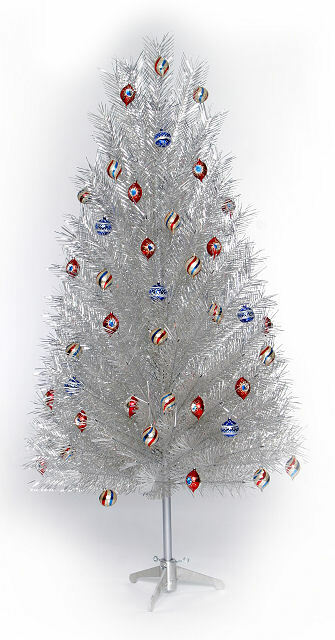 These high-quality nostalgic trees are a hand-made re-creation of the deco 'Space Age' aluminum tree of the 1950s. They are made to last for many Christmas seasons to come! Aluminum Christmas Trees. We have the largest selection to choose from and the best prices with FREE shipping** on our 5', 7' & 9' new aluminum tree orders. Each tree comes with a two year warranty. Click on a tree size below for full details/specifications and ordering options. Also, only trees ordered from Oak Tree Vintage come with 2 FREE spare branches. For maximum viewing pleasure, order at least two color wheels. SORRY, BUT AS OF 12/3/12 - ALL ALUMINUM CHRISTMAS TREES COMPLETELY SOLD OUT...FOREVER! FACTORY IS GONE. Ornaments shown in photos sold separately. ATTENTION: DO NOT INSTALL OR USE ELECTRICALLY POWERED STRINGS OF LIGHTS WITH ALUMINUM CHRISTMAS TREES. THIS WOULD PRESENT AN EXTREME, ELECTRICAL SHOCK HAZARD, AND INJURY OR DEATH WOULD BE LIKELY. USING COLOR WHEELS AND COLORED SPOT / FLOOD LIGHTS, PLACED AWAY FROM THE TREE IS THE TRADITIONAL WAY OF ILLUMINATING THEM. IT IS IMPERATIVE THAT ANYONE THAT WILL EVER BE SETTING UP THE TREE BE AWARE OF THIS. ALSO WEAR LIGHT GLOVES TO PROTECT YOUR HANDS WHILE ASSEMBLING AND DISASSEMBLING YOUR ALUMINUM TREE. ALSO EYE PROTECTION IS RECOMMENDED WHEN WORKING WITH ANY CHRISTMAS TREE, ALUMINUM OR OTHERWISE TO REDUCE THE CHANCE OF EYE INJURY FROM BRANCH ENDS OR NEEDLES. Trees and Color Wheels purchased between Dec 1st and Jan 1st cannot be returned for refunds or credit. After Christmas, trees may only be returned for defective warranty replacements and replacement parts, on the rare occasion a part should go bad. ** 'FREE SHIPPING' offer is currently for NEW 5' and larger trees and covers orders shipped to US, Lower 48 state locations. Other locations, states and countries can be calculated. 'Free Shipping' does not apply to new 4' trees, 'Vintage / Original / Antique' Trees or 'color wheels'. Only UN-OPENED, Un-Damaged and re-saleable trees are accepted for return for credit. Please read and understand dimensions carefully. Trees and color wheels cannot be returned for refunds or credit after Dec 1st. Prior to that, tree and color wheel returns subject to 30% restock fee, and must be in "NEW", Resalable condition. Shipping is not refundable. After Dec 1st, trees and color wheels may only be returned for defective warranty replacements and replacement parts, on the rare occasion a part should go bad.